Tips: Prior to first use, charging the light for two sunny days. If battery capacity reduces over time, switch the light off for 3-5 sunny days in order to boost the batteries. Light up 10 hours in summer and 5 hours in winter after fully charged . Charging time: 8 hours. Weather will affect lights' working time. Description: The TomCare torch light NEVER NEEDS BATTERIES. COMPLETELY RUNS ON SOLAR POWER. Now you can have the warm torch light without ever having to light a match or throw a switch. Best of all, there are no dangerous flames; LEDs in the light cast a safe, soft, mood-enhancing glow. During the daytime, they are retracted, and absorbing solar energy. 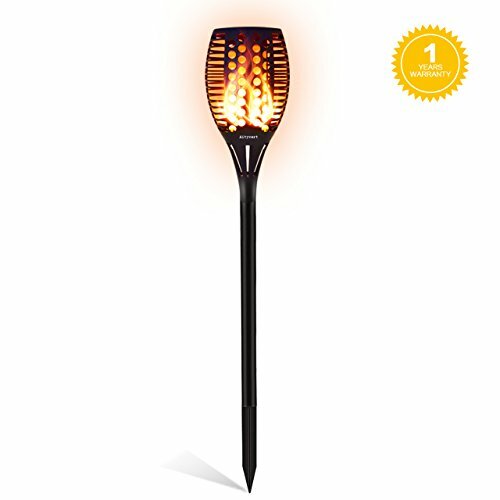 At dusk, they literally pop up and light up, giving you lights along a pathway, driveway, deck or dock that aren't in your way during the day. Includes installation hardware, completely wireless. Powered by a rechargeable battery that's solar powered. Up to 12 hours working time after fully charged. LONG WORKING TIME - Built-in rechargeable battery (2200mAh). Light up 12 hours after fully charged. Charging time: 8 hours. 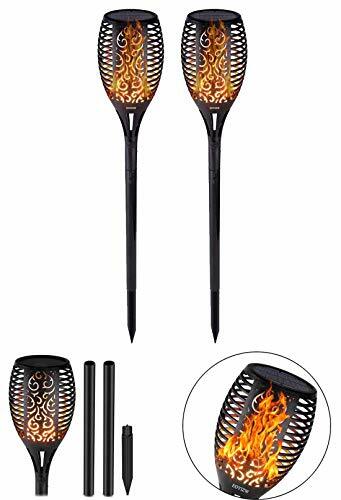 Unique Flames Design: These torches lights truly prove to be a very safe alternative to the real flames as they don't actually carry real fire. It is actually made with LEDs that cast a rather soft, mood-enhancing, pleasant glow. Though it may not spread a bright light, but it is effective enough and can be used when for making your environment pleasant. These lights use unique optical controlled technology, which helps to create a rather beautiful, romantic landscape of changing. Eco-friendly: It never needs rechargeable batteries. Rather, it uses solar energy to charge itself. It collects solar energy all day, and then it automatically turns on at dusk, casting a soft and pleasant light on its surroundings. It requires almost 8 hours of charging, which is carried out in the daytime. It comes with a built-in Li-ion Battery - up to 2200mAh - which lights up to 10 hours in summer season and is on for 5 hours in the winter, after it is charged fully. Weather Resistant: it is not affected by any harsh weather, including scorching heat, or dreadful winter, along with furious downpour; these lights will survive all, and that too, round the year! It is waterproof, so that it withstands the downpour, as well as unexpected water outbursts. As a result, it is naturally made to be durable and sturdy (as certified to IP65). Easy to Install: These torches lights are flexible and very much easy to install. You can install anytime and anywhere you want to have it displayed. The torches come without any wires and stuff. So, when you want to use it, you simple have to install it at the place you prefer, and then, you just have to enjoy the warm, romantic torch light. By installing it, we mean that the lights' stake should be hanged - if it's on a wall - or pushed down, if it's in soil. Inexpensive: Without more revenue being spent on extra stuff related to it, these torches lights are quite inexpensive. The fact that it is durable and flexible makes it a favorable choice for all the people. One doesn't have to spend extra money on its repairing and other stuff. Please SEE "Special offers and product promotions" . The Bebrant Torch Light features a fascinating dancing flame design it truly prove to be a very safe alternative to the real flames as they don't actually carry real fire. LEDs cast a rather soft, mood-enhancing, pleasant glow.When they are in your garden, you will definitely get attention and praise from your neighbors and friends. It collects solar energy all day, then turns on automatically at dusk. The Torch light runs on solar power, so you don't need to add oil,save money and save trouble and no pollution. It comes with a built-in Battery - up to 2200mAh - which lights up to 12 hours after fully charged. Charging time: 8 hours. Waterproof and Durable, withstand all kinds of weather all round the year. Easy to install no wiring required, the package comes with accessories so you can choose 30.7in and 42.9in height.simply install it anywhere you like and enjoy the warm torch light. Duration of use: Light up 10-12 hours in summer and 5 hours in winter after fully charged. Prior to first use, please charge the outdoor solar lights torch light for 1 sunny days. Maybe the ground is too hard, do not twist or hammer it with force. Try to soften the ground with water and then insert into the ground. Please be kindly note that as a solar powered product,the working time is weather sensitive. 30 days money back guarantee,1 year free warranty,easy-to-reach 24-hours email response. DANCING FLAMES DESIGN - This solar flame torch light is a safe alternative to the real "flames". For your garden party, BBQ and camping out, provide a perfect campfire atmosphere. SOLAR POWERED TORCH LIGHTS - No oil.No fires.No pollution. No radiation. It collects solar energy all day, then turns on automatically at dusk.It also has a manual switch that you can turn on and off at any time. LONG WORKING TIME - With high-capacity 2200mAh built-in rechargeable battery. It works up to 12 hours in summer after fully charged. 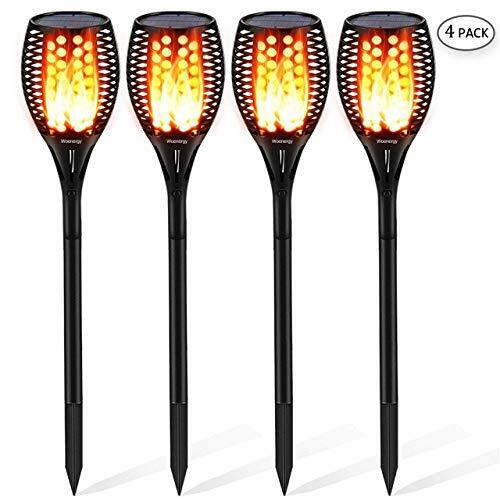 EASY INSTALLATION -No wiring and electric need, just place the solar flame lights into your lawn, garden, a flower pot, pathways.The added accessories in the package allow you to choose 30.7in or 42.9in heights. WEATHERPROOF ETERNAL FLAME - IP65 waterproof and dustproof design. Extremely durable and able to withstand all kinds of weather all round the year. Solar panels have a lifespan of more than 5 years. 12-Months Free Warranty and lifetime customer service. 10.Protect Function : Over Charging. Over discharging. Over cur rent , short circuit. 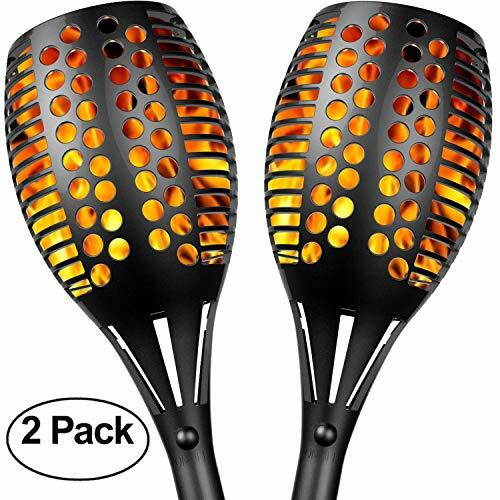 *Creating the romantic feel of a flickering flame for your party,barbecue,camping.Making these the perfect addition to poolside,backyards,patios or any outdoor environment.Transform your yard into a tropical paradise. *Before Use,Make sure to expose the light during the day using the sun's rays to fully charging the battery for 2 more days.Please be kindly noted that as a solar powered product,the working time is weather sensitive. Great Decorative Landscape for outdoor events & areas such as Yard,Pathways,pool,garden,bench,patio,fence,deck. Take on ancient Maori traditions by creating boundaries around any outdoor activity with SKYLINE Bamboo Tiki Torches! They add functional appeal to any outdoor entertaining by creating light from real oil-burning torches. They are great for luaus, beach, tropical, or jungle themed parties. Bamboo tiki torches are excellent party lighting for all occasions or just as beautiful backyard d cor. Torches can also be used for birthdays, engagements, romantic dinners, and more. 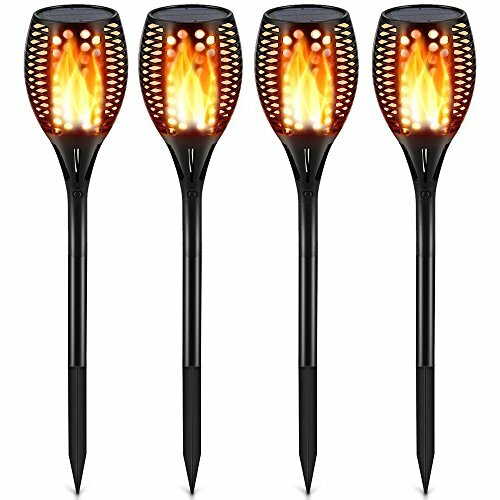 These torches accent any outdoor setting with incandescent natural flames. The bottom of the torch is speared for smooth entry into the ground. The reinforced canisters hold approximately 6oz and last approximately 7 hours before needing to be refilled. They work with most torch oils to add a luminous ambiance. They can also be used for insect and mosquito control depending on what oil is used. Oil is not included. Tiki torches are for outdoor use only. They measure approximately 48" long. ILLUMINATE YOUR SURROUNDINGS: Set the mood and add ambiance to your outdoor festivities. 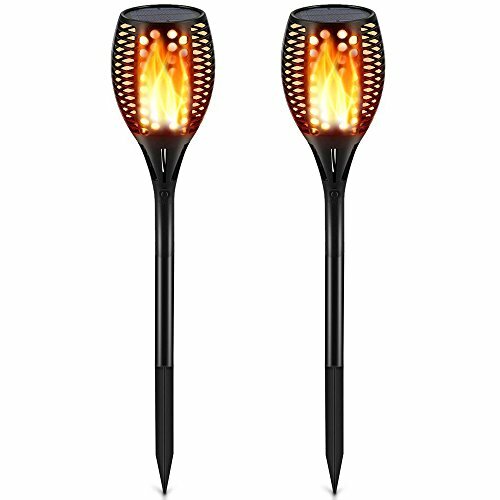 These real oil-burning torches create incandescent natural flames for light in any outdoor setting, making them perfect for backyard parties and celebrations. QUALITY CONSTRUCTION: Made using a one-piece, natural bamboo shaft, these bamboo torches feature a sturdy design for long-term use. Unlike similar products, Kaya Collection offers a 100% bamboo product for better functionality and a more authentic feel of the tropics. 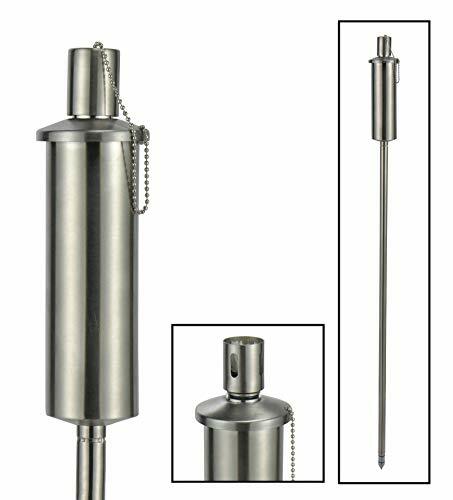 LONG-LASTING LIGHT: Although small in size, the refillable oil canisters are long-lasting to provide many hours of illumination and pest control. Each canister is reinforced with a metal ring to prevent tipping over or leaks, unlike cheaper quality competitor products. MARK BOUNDARIES: Use Kaya Collection's bamboo torches to brighten pathways or use as decor for Luau or tropical-themed parties. They are perfect for weddings, anniversaries, birthdays, barbecues, pool parties and other events. INSECT CONTROL: Keep pesky mosquitoes and other biting insects at bay when you're outside! To reap this benefit, fill the canisters with lemon eucalyptus essential oil, citronella, neem or another insect-repelling oil and enjoy the outdoors pest-free. 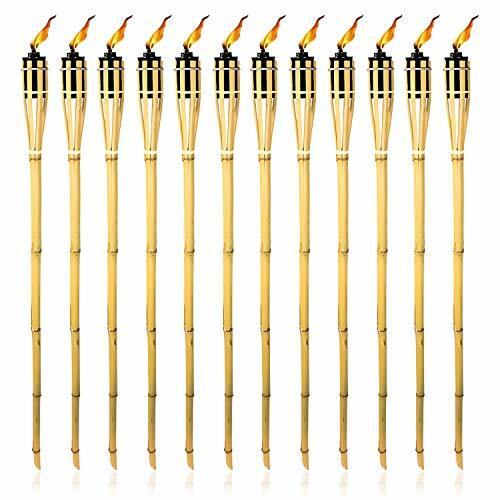 SET THE MOOD WITH 12 TORCHES: Twelve Bamboo Torches - each four feet high with a spear bottom stake - will produce a laid-back atmosphere in your backyard or patio. Each torch has a refillable, 6-ounce container for up to 7 hours of burning time. 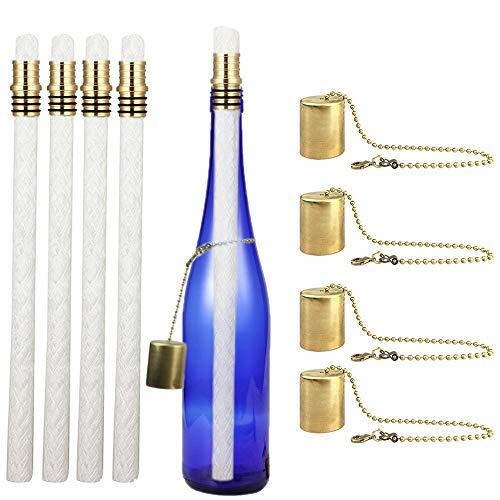 EricX Light Tiki Torch Kit 4 Pack perfect for garden lighting, tiki bar, or outdoor lighting. Includes 4 long life tiki torch wicks ,brass Tiki Torch Wick Holders And Brass Caps. Help you creates beautiful wine bottle Lights, beautiful garden lighting. Great alternative to garden decor solar lights, or solar path lights, DIY wine bottle light. Can use most Standard Glass Bottle: Whiskey Bottle, Bourbon Bottle, Wine Bottle, etc - just add your own! NEVER NEEDS BATTERIES, COMPLETELY RUNS ON SOLAR POWER: It collects solar energy all day, then turns on automatically at dusk. The solar spotlights runs on solar power, so you can place it anywhere! LONG WORKING TIME - Built-in rechargeable battery (2200mAh). Light up 10 hours in summer and 5 hours in winter after fully charged . Charging time: 8 hours. IT PRODUCES LEVEL 14 LIGHT. Sometimes it's just easier to buy the Torch instead of crafting it, especially IRL. So, when you've run out of charcoal and wood or just can't seem to make enough to stop hostile mobs from spawning, get yourself the Minecraft Wall Torch. Place one every 12 blo-feet in your home along the walls and it'll stop any hostiles from popping up. Another plus is the most recent patch enabling you to mount your torch on glass. Melt away that snow or prevent your lake from freezing, only in a 2-block radius of course. You can even mount it in a pumpkin for an adorable jack-o-lantern. Okay, don't actually do any of that, it'll just end up breaking. Just mount it on your wall because it looks cool and maybe, MAYBE it'll keep zombies away. So far, it seems to be working. KEEP HOSTILES AWAY - Keep hostiles away from your room with the Minecraft Light-Up Geek Wall Torch that looks just like to torch from the game. HANGS ON WALL OR SITS ON TABLE - The Light-Up Torch is good for hanging on walls. Its corner folds down exposing two keyhole mounting slots (mounting hardware not included). It can also be placed on tabletops. ABS PLASTIC - This Wall Torch is made of high-quality ABS plastic. Wipe clean with a dry cloth. Requires three AAA batteries. Dimensions: 11 x 2 1/4 x 2 1/4. FOR AGES 6 AND UP - The Light-Up Wall Torch is suitable for kids age 6 and above. 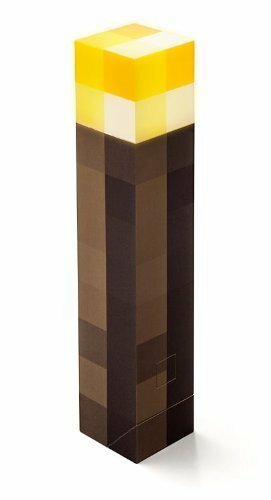 OFFICIALLY LICENSED MINECRAFT COLLECTIBLE - The Light-Up Wall Torch is officially-licensed Minecraft collectible.